The Zeroz wallet is so slim it’s almost an anti-wallet. It comes in three sizes, extra-small, small, and medium, which I would describe as minimalist, average, and kitchen sink, but that’s just me. There are a couple of design, texture, and color options as well. 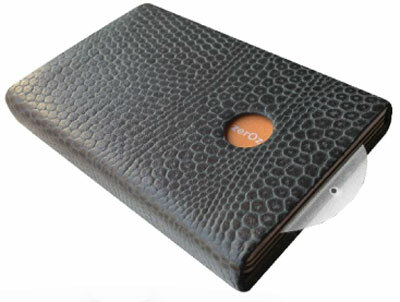 Zeroz wallets are made from Italian leather, although certain textured or patterned leather might be sourced from elsewhere. It looks like cards can be entered or removed from either side of the wallet, and small removable plastic tab pockets allow for quick-access of your most-used cards. An optional grippy and stretchy cashStrap holds a couple of bills on the outside of the wallet. Pricing seems reasonable, at about $36-$42 depending on size, style, and options. An extra pack of tabs is $5. Overall, the Zeroz wallet does looks quite neat. I pay for 99/100 in-store purchases with a credit card these days. 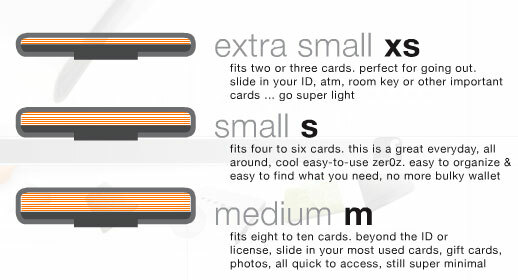 I’ve never been fond of money clip-style wallets, but Zeroz’ design looks a bit more practical. Plus it’s a money strap, not a clip, so it can potentially hold other things (like hotel keycards that I have a habit of demagnetizing). Maybe it is time I traded my wallet in for a nice slim card case like this one.